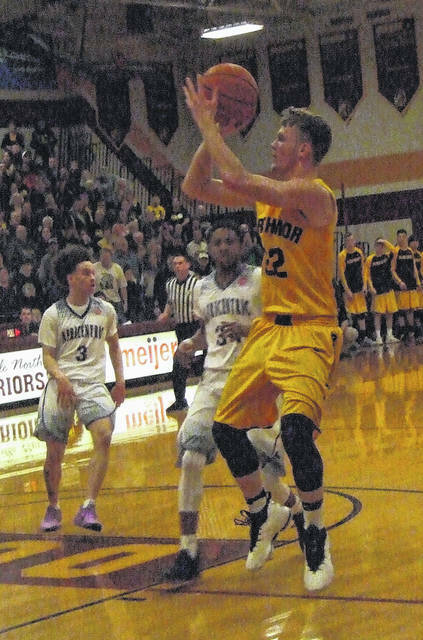 A historic year for the Northmor Knights came to an end against Africentric Tuesday night at Westerville North High School. The Knights, who finished their season with a team-record 23 wins, fell in an early hole against the Nubians and could not recover in suffering a 68-49 loss that ended their year at 23-2. Northmor struck first blood in the game, as Demetrius Johnson hit one-of-two free throws to give his team the early lead. However, Africentric’s pressure defense got to the Knights in the opening period, forcing multiple turnovers and holding Northmor without a score for over six minutes. During that span, the Nubians tallied 13 straight points with the Central District’s Division III Player of the Year Tre’ Baumgardner leading the way with seven of his game-high 22 in that span. While the Knights were able to get untracked offensively in the final minute of the period, getting baskets from Blake Miller and Brock Pletcher, they still trailed 18-5 after eight minutes. Making matters worse for the team, first-team all-district and all-league point guard Demetrius Johnson got in foul trouble and had to sit on the bench for most of the second quarter with three fouls and his team trailing 20-6. Pletcher helped pick up the slack, hitting three three-pointers in the period and drawing his team as close as eight points before three late free throws by Baumgardner gave the Nubians a 29-17 advantage at the half. Unfortunately for Northmor, it would be Africentric using the long ball to their advantage in the third period, getting five over those eight minutes to rapidly expand their lead. Davis hit two in the early going, while Dorian Holloway added a pair of short-range buckets to stake Africentric to a 39-21 lead. While Kyle Kegley scored five points for the Knights to get them within 16 at 42-26, Davis would add a third shot from beyond the arc. After a bucket by Pletcher, Baumgardner added two more three-pointers as his team took a 51-30 lead into the final period. While Northmor kept battling back in the fourth, they would be unable to get any closer than an 18-point margin despite getting six points from Johnson, five from Lane Bachelder and four from Pletcher during that span, as Africentric moved on to the district finals. After the game, Ruth had nothing but praise for the Northmor community, which supported the team to the extent that both sides of the Westerville North gym were packed with Knight fans, as well as his seniors. The Northmor team will have a vastly different look next year with the graduation of starters Johnson, Pletcher, Kyle Kegley and Tyler Kegley; as well as reserves Bachelder, Eason Neal and Andy Tupps. Pletcher hit three three-pointers in finishing with a team-high 19 points, while Johnson finished with nine. Ruth noted that his hope is for his players to finish off their basketball obligations and go through the spring sports season knowing what they accomplished. 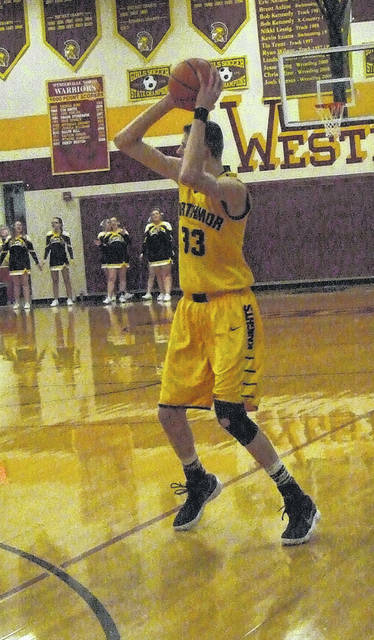 Brock Pletcher led Northmor with 19 points in their Tuesday night battle with Africentric. Northmor’s Kyle Kegley looks to pass the ball against Africentric in the district semifinals.